I know, discussing Telltale Game and its closure is a hot topic right now, but while I feel absolutely gutted for the 250+ people who lost their jobs and the way everything was handled, I don’t believe a review is the place to truly dig into all of that. Instead, I want to discuss and celebrate what I think could quite possibly be the best game they ever released. 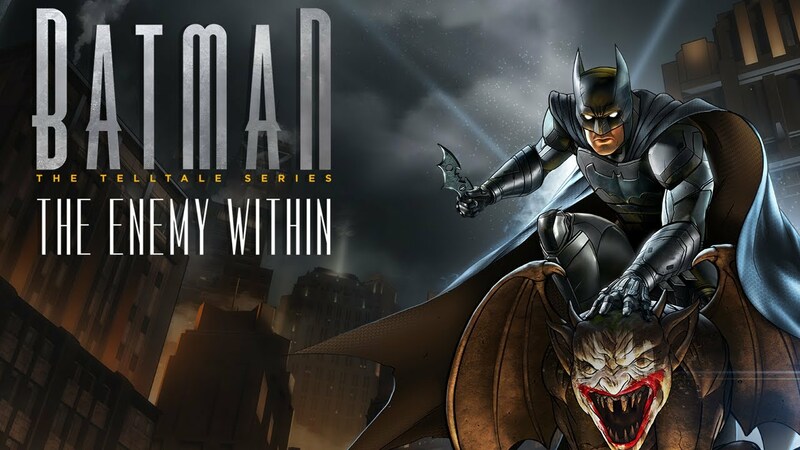 Although I deeply love Telltale’s first season of Batman and the many artistic liberties it took to establish a bold new narrative in that universe, I think their second season, The Enemy Within, is even better. So much so that if anyone were to ask me what my favorite Batman story is, I would probably reply with this. The Enemy Within, while most definitely containing Batman, is primarily a story about Bruce Wayne and his relationship with John Doe, who fans of the first game will remember as a patient from Arkham Asylum. The first season set up John as the man who will eventually one day become the Joker, but what’s so amazing about The Enemy Within is that there’s the possibility to change that. While there’s an overarching narrative involving the Riddler and his newly formed group of villains known as The Pact, the relationship between Bruce and John is front and center for the majority of this season. When John loudly shows back up in Bruce’s life in arguably one of the most inappropriate times, Bruce is left with a heavy conundrum. Does he push himself away from John and his growing dark intentions, or does he take him under his wing (no pun intended) and try to nurture a more lawful personality and help him overcome his inner demons? The relationship between Batman and the Joker has been explored before, but this story takes an utterly fascinating approach by asking what could happen if the Joker never became a villain in the first place. As previously mentioned, the Riddler and his gang are the primary antagonists of this season. John has managed to make his way into the gang and has fallen in love with another member, an abrasive young woman named Harleen Quinzel. Harleen (or Harley, as John affectionately calls her) is one of the higher ups in The Pact and assumes a leadership role akin to being the Riddler’s right-hand woman. This shifts the power dynamic of the Joker/Harley relationship fans have known for years, with Harley being the one in charge and John being the love sick puppy. In the first season, John helped Bruce out of a tough predicament, telling him that he would owe him a favor in return later. Well, John has decided to cash in on that favor and wants Bruce to join The Pact and help him rise in the ranks and win the affection of Harley. On one hand, this allows Bruce to get close to his enemies and gather valuable information to take them down, but on the other, it allows his enemies to get close to him and potentially learn of his identity as Batman. This also leads to some of my favorite interactions between Bruce and John/Joker to date, such as a moonlit night on the town with Bruce giving woman advice and the two of them role-playing to teach John how to talk to women. Although John is undoubtedly the star of the season, the depiction of the other villains in this game is incredible. The Riddler is a much older man with a long history of crime in Gotham, Harley is a wild maelstrom of fury and insanity, and other villains (which I won’t mention, because, you know, spoilers) are fleshed out wonderfully and feel both familiar and new at the same time. Another new introduction to Telltale’s Batman universe is Amanda Waller, head of the Agency, a secret government group called in to capture the Riddler and dismantle the Pact. She’s a ruthless woman who believes the ends justify the means, which is a stark contrast to the moral system of Batman… or is it? The selling point for any project by Telltale has been character choice, allowing you to decide the outcome of their stories and change the way different characters behave. That’s no exception with The Enemy Within, where you can choose to have Batman side with Amanda and be more vicious, or join forces with his long-time partner Jim Gordon and do everything by the books. More so than any other game they’ve released (including the first season of Batman) I felt like my choices had more impact in this story, with consequences that were far more varied than previous games they’ve released. Other key characters include Alfred, Bruce’s butler, closest friend, and closest thing he has to a family member. The events of the last game have taken a toll on Alfred, resulting in him questioning the actions he and Bruce are taking as well as causing some serious physical health issues. The growing strain on Bruce’s relationship with Alfred never feels forced to garner sympathy from the player and some of the final decisions you can make in regards to this story arc are heartbreaking. There’s also another new face in the form of Tiffany Fox, daughter of Lucius Fox, the man responsible for making Batman’s gear. Tiffany is introduced as a new employee at Wayne Enterprises, working in tech just like her father. She’s a smart, but opinionated young woman with incredible drive and passion. Tiffany is actually one of my favorite character in this season, with a terrific and compelling character arc. Unfortunately, she has considerably less screen-time than other characters, only popping up for a few scenes per episode. I know I’ve been talking a lot about Bruce Wayne, but there’s plenty of Batman too. While scenes with Bruce are more prevalent this season and center primarily on conversations with other characters, the Batman segments are where the combat and puzzle areas reside. Combat in The Enemy Within is similar to combat in every other Telltale game, but it feels more polished this time around. You don’t take full control of your character during fights, but that doesn’t mean you just stand around and watch them either. In most scenarios, a prompt will flash on the screen and you’ll have mere seconds to push the thumbstick in the correct position or press the corresponding button. In previous Telltale games, there was occasionally a problem of the game not registering your inputs correctly, making some encounters feel cheap and broken. Thankfully, I never once had that problem with The Enemy Within and found myself able to do all of these inputs perfectly fine. An interesting new addition to the combat is the ability to make choices. There are multiple scenarios where you can choose between different gadgets, interact with parts of the environment, or choose a more or less lethal option to take people down. The choices in combat don’t really have any lasting impact on the story, but they offer up variety and make it so fight scenes don’t seem repetitive on a second or third playthrough. There’s also a handful of segments where you have to utilize the different vision modes on Batman’s cowl to scan the area for clues and solve puzzles. None of these segments are necessarily bad, but the fact that pretty much everything is outlined for you takes away any real detective work, making puzzles feel incredibly easy. I’ve always said that Telltale made great games for people who don’t normally play them while still making an enjoyable experience for those who do, and Batman: The Enemy Within is no exception. While I would still wholeheartedly recommend the first season of Telltale’s Batman, The Enemy Within works perfectly fine on its own. There’s a nice little recap in the beginning of the first episode, but you can also go online and look up a quick synopsis of the first season’s story if you want more information. Although The Enemy Within does occasionally reference the first season and continues some of its threads, it’s primarily a game anyone can jump right into and tells a fantastic stand alone story. As someone who has played nearly every single Telltale Games release, I feel perfectly confident in declaring The Enemy Within to be the best game they ever made. It tells one of the greatest Batman/Joker stories that I’ve ever seen and is full of choices you can make to branch that story in several different outcomes. The whole concept of having the ability to prevent the Joker from ever becoming the Joker is incredible, making this easily my favorite Batman story to date. Although there’s some admittedly too easy puzzles, the characters, story, and improvements to combat make The Enemy Within a solid and satisfying experience and an absolute must-play for fans of the Batman universe. This entry was posted in Batman, PC, PlayStation, Video Games, Xbox and tagged Batman, Joker, PC, PlayStation, Review, Video Games, Xbox. Bookmark the permalink.